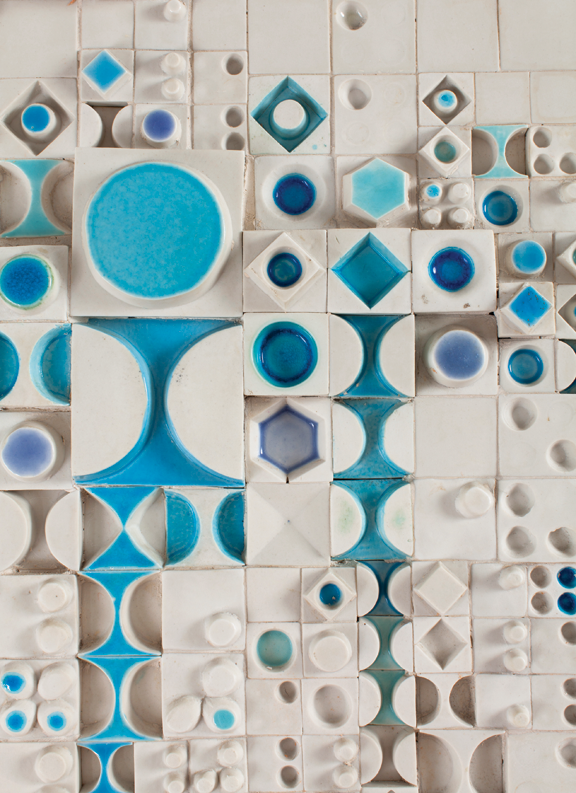 This untitled wall relief by Rut Bryk is composed of numerous modular ceramic pieces at varied depths, characteristic of the artist’s style during this period of her career. The piece exemplifies her sparing use of color—with subtle gradations of blue and teal—and her delicately built, geometric forms and patterns. Designer Rut Bryk (1916–1999) was born in Stockholm, Sweden, and spent her education and adult life in Finland. She graduated from the Central School of Industrial Crafts in Helsinki in 1939, and began working in the art department of the Arabia ceramics factory in 1942. During the first phase of her ceramic work, she created wall pieces with figurative motifs—butterflies, humans, animals, plants, and still lifes. 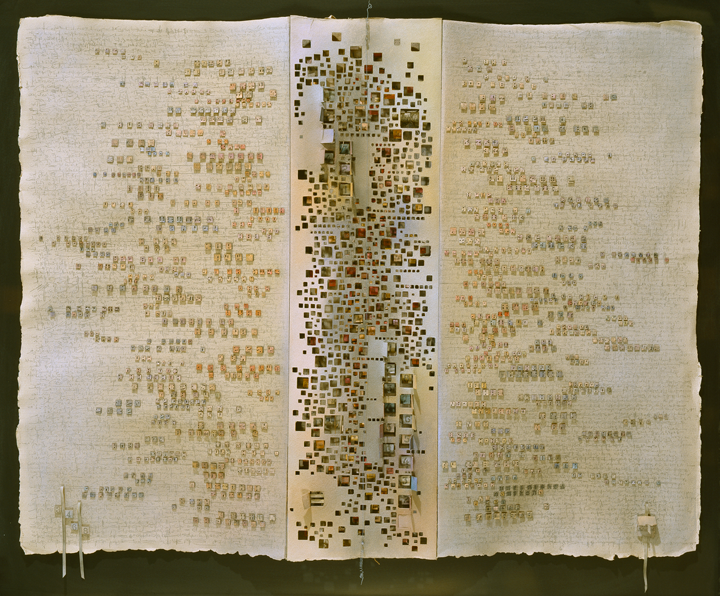 In the 1960s, she began making abstract wall-hung compositions, such as the piece on view in Pathmakers, as well as textiles. In the 1970s, some of her wall-relief works grew larger and were integrated into the architecture of civic buildings in Helsinki. She was married to celebrated Finnish designer Tapio Wirkkala (1915–1985). Bryk’s work in this style was inspired by colors and patterns from “the traditional folk art of India and southeastern Europe.” She had studied printmaking, and she was hired at the Arabia factory specifically to work on ceramic wall pieces, which were popular in the 1930s and ’40s. In her decades working in ceramics, she created a wide variety of art and also decorated functional pieces in the medium. In NMWA’s collection, Elena Presser’s Unfinished Symphony (1982) shares Rut Bryk’s aesthetic—geometric forms in relief emphasizing pattern and rhythm. Presser (b. 1940), an Argentine-born, U.S.-based book artist, uses her work to convey the abstract beauty of music. On the book’s central panel, inspired by a piece by Franz Schubert, viewers can peer through cut-out squares to view colors and shapes behind the surface. On the two outer panels, subtler squares protrude from the surface to evoke the music’s “mysterious quality and unfathomable beauty,” the artist says.